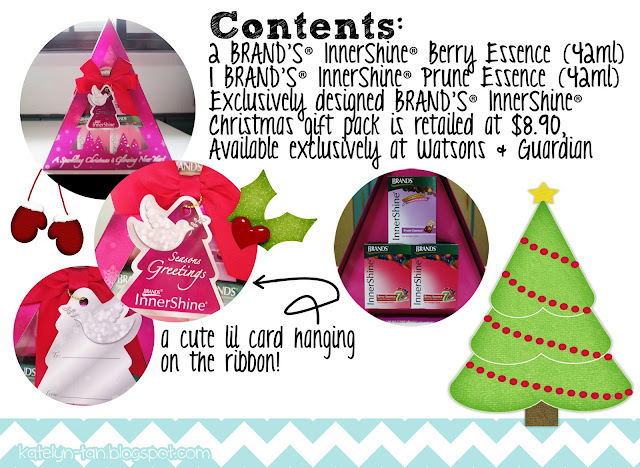 [Review] BRAND’S® InnerShine Christmas Gift Pack + Christmas Giveaway! 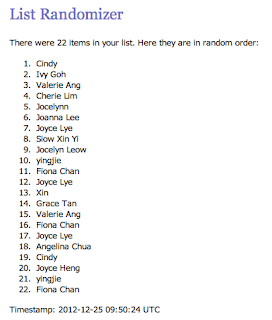 Congrats to Cindy Kho for winning! Jingle bells, jingle bells, jingle all the way! Christmas is near! Yay! Cracking your heads to think of what below $10 gift to buy for gift exchange? Let me share something with you all today :) I think it will make a perfect gift for your friends! Don't you think it's a great gift for the beauty and health conscious ones? Plus it has already been nicely and neatly packaged! You can write the to and from and also a short lil message there! A little more about the contents in the gift pack and how beneficial/healthy they are? :: Contains 7 types of premium berries specially selected from Europe & America – Blueberry, chokeberry, cranberry, blackcurrant, acaiberry, elderberry and strawberry. :: Combination of 7 berries is an excellent source of anti-oxidants, which neutralizes harmful free radicals in the body and prevents degeneration of eye cells. :: Contains Zinc, and is fortified with Vitamin A, C & E, providing the required nutrients to benefit eye health. :: No artificial colouring and preservatives. :: Rich in dietary fibre from prune pulp and skin to promote regular bowel movement, prebiotics (Oligofructose and Inulin) to encourage growth of friendly gut bacteria and Vitamin C to maintain skin elasticity and radiance. :: Also contains pomegranate, a good source of anti-oxidants, to protect cells from harmful free radicals in the body. :: Specially formulated to enhance overall inner well-being through the promotion of intestinal health, which in turn translates to clear, radiant skin. :: No added sugar, colouring or preservatives. Time to share your beauty secret of nourishment from within with your girlfriends! One lucky winner will win a BRAND’S® InnerShine® Christmas Gift Pack! Contest ends on 25 December 11.59am! and will be contacted through email. 1. Tweet "I love BRAND'S Christmas Gift Pack! Hope I can win one from @tanhuiping at www.katelyn-tan.blogspot.com :)"
2. Share the photo on my facebook page and comment on the photo "I love BRAND'S Christmas Gift Pack! Hope I can win one at www.katelyn-tan.blogspot.com :)"
You can choose to do both too if you want and as many times as you want. But the main thing is you MUST do what is stated above first (the part about liking BRAND'S facebook page and commenting at the bottom of this blog post). What are you waiting for? Hurry and join the contest now! :) All the best! Is a great idea! I was thinking of what to buy for gift exchange. THANKS Katelyn.